A fully functioning Android tablet with superb picture and sound, and a range of apps available. 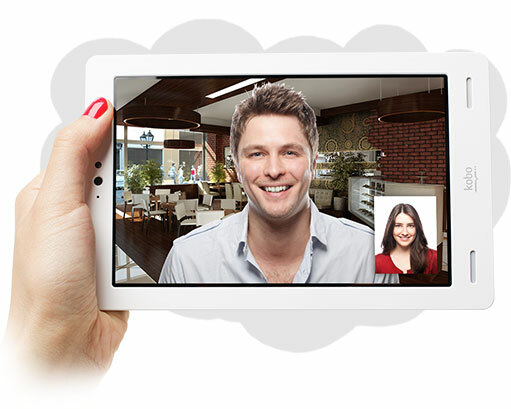 Front facing camera is great for video chats, notsomuch for taking photos and videos of others. 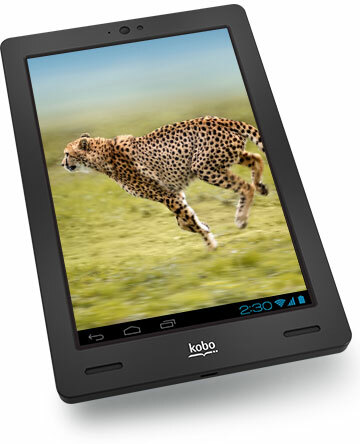 With exceptional picture and sound, a plethora of options for apps and books, and a reasonable price – the Kobo ARc definitely deserves a second look for consumers looking for an eReader with all the functions of a great Android tablet. 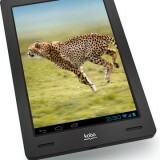 The Kobo Arc offers gaming, web surfing, a variety of apps, and of course – loads of reading. 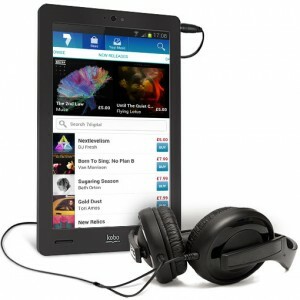 But can it hold its own in the highly competitive 7” tablet market? Let’s face it – there are a lot of tablet eReaders on the market now, and if a company wants to stand out from the crowd, they are going to have to offer some advantages over the others. At first glance, the kobo arc looks pretty similar to the competition, but as you begin to play around with it you’ll find a lot to love. First of all, it is very sturdy, with a great soft plastic backing that is easy to grip and is even customizable, with a variety of colors available. You’ll find a front facing camera top and center, and two front facing speakers on the left and right bottom of the screen. This makes video chatting a breeze, with really vibrant sound for such a small device. The included 1.3 MP camera takes both still photos and videos, but the front facing camera makes that aspect a bit more challenging (unless, of course, you are using the camera on yourself). The photos are about what you’d expect from a tablet – a little bit fuzzier than a good camera, but worth it for the convenience. The videos are really quite good, if you can get around the awkwardness of placing it properly to record someone else. The Arc camera is really best used on yourself. There is no Home button – or any buttons at all – on the front of the device, in favor of virtual buttons located on the bottom of the screen. In fact, the only buttons on the kobo arc are your power button and the volume controls, located on the top right corners of the device. The whole thing has a very sleek design that is both aesthetically pleasing and easy to use, as you won’t suffer from accidental button pushes mid-read. Speaking of reading, the Arc really has me pleased with its eReader abilities. 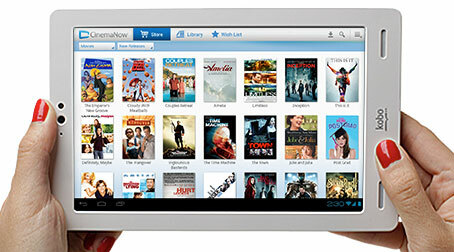 If you’ve tried out any other eReaders, you’ll know that the biggest issue with each of them is with access to books. The Kindle Fire, for instance, limits you to the Kindle store for your purchases. The arc gives you pretty much unlimited access to e-books. Naturally, the Kobo reading app comes pre-loaded, and the Kobo Store gives you access to literally millions of books, right at your fingertips. But what if you’re upgrading your e-Reading experience? Many of you, like me, already have a standard eReader without tablet capabilities. With a proprietary tablet, you may be stuck either hanging on to your old eReader, re-buying your books, or simply taking a loss on your previous purchases. Not so with the Kobo Arc. One of the biggest advantages that the Arc offers over the Kindle and Nook tablets is full access to Google Play, allowing you full access to any Android apps you like – including the Kindle app. This is useful mostly because if you have already purchased books from Amazon (and who hasn’t?) you’ll still have complete access to them on your new Arc – in addition to all those great new books available on the Kobo Store. The eReader functions similar to others, with a swipe or tap on the side of the screen turning the page for you. You can even comment on pages in your books, read comments from others, post your reading activity on Facebook, and more. There’s even a reading achievements system for readers who happen to love chasing cheevos. It really adds a social element to a solitary pastime – but it’s also all very unobtrusive, for those of us who want to keep our reading a private thing. You’ll also have access to tons of games, music, news, and more, because Google Play is one of the best app stores out there. Apps are easily accessed through the tap of a button at the top right of your screen, and performance is top notch. Those front facing speakers make for an immersive gaming experience, and we experienced no hiccups or lags at all on any of the games we tried out. And the picture? Wow is all I can say – I was very impressed. While streaming movies, I found the picture and performance both outweighed all expectations, with crisp and clear video, vibrant colors, and a great experience overall. Another thing that you’ll find on the Arc that you won’t find on similar tablets is Kobo’s new Tapestries software. What you get out of it is really up to you, but if you are the type to organize and re-organize, you’ll be thrilled with the prospect of placing anything and everything into tidy little categories. The Arc is pre-loaded with Reading, Entertainment, and Browsing, but you can edit and change and customize as much as you like, all at the click of a button – a simple little icon that resembles a thumbtack, which will give you the option to “pin” to either your tapestries or your bookmarks. While the Kobo Arc does not offer any room for expansion, you can choose from 16 GB, 32 GB, and a 64 GB model, which offers tons of space for all your favorite photos, apps, books, and more. With exceptional picture and sound, a plethora of options for apps and books, and a reasonable price (no ads either!) – the Kobo ARc definitely deserves a second look for consumers looking for an eReader with all the functions of a great Android tablet.